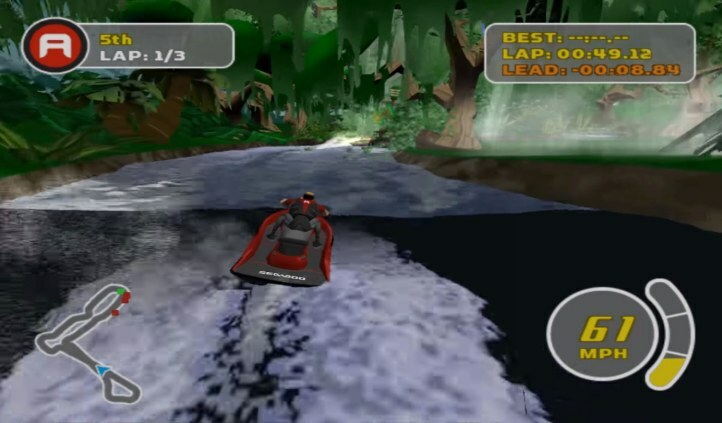 When Wave Race 64 was released back in 1996 on the Nintendo 64 I instantly became fascinated with Jet Ski racing games. Me and my older brother used to have competitive Split Screen races against each other in Wave Race 64. 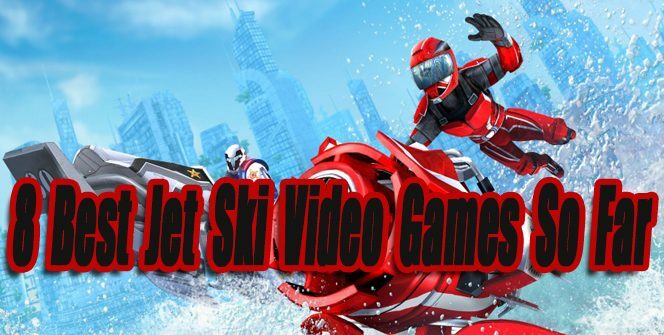 Fast forwarding to 2018 Jet Ski games are not as popular as they once were, but new quality titles continue to be released. 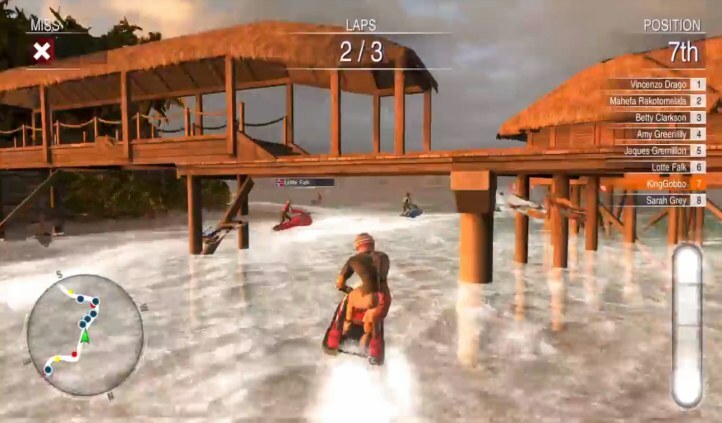 This article features the 8 best Jet Ski Video Games released so far. When new worthy games are released this article will be updated. If you’re seeking a jet ski racer with a lot of insane tricks and tracks with multiple secret paths, Jet X20 is worth checking out. Jet X20 features 8 exotic tracks to race through and a high energy announcer. Each playable character has there own personality and unique special trick that can be performed once there trick meter is full. The dated graphics and physics do not hold up well today, but for a PS2 game Jet X20 still looks ok. The number of tracks are limited and the generic trick gameplay becomes boring fast. 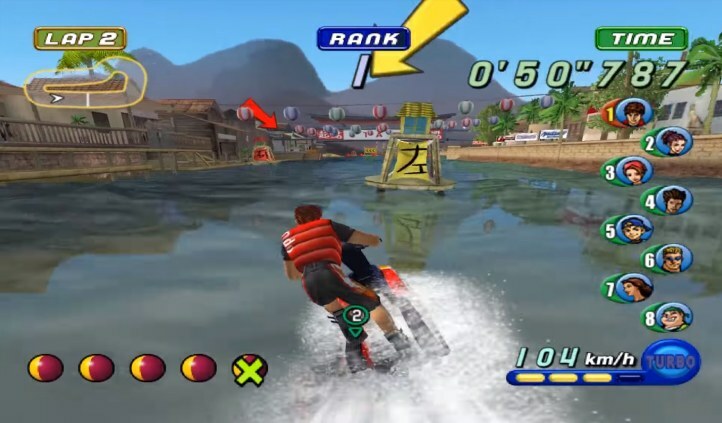 Jet X20 attempted to create the Jet Ski SSX version, but because of the thin content and lack of quality, Jet X20 doesn’t measure up to SSX. Note: The HD screenshot above is taken from an emulator, the actual game on a real PS2 does not look that good. Aqua Moto Racing Utopia shines most in the varied track designs, exciting announcer, and the number of tracks it offers. There is a lot of gameplay here, and it kind of reminds me of Wave Race. Most tracks will require you to race in and out of buoys that are placed down. Aqua Moto is most fun when racing against players online or 2 players via split screen. The controls feel a bit clunky in Aqua Moto compared to other recently released Jet Ski racers (like Riptide GP: Renegade). The visuals in Aqua Moto are a little inconsistent, the water looks great but the overall graphics can look ugly at times. Aqua Moto also feels a little sluggish when it comes to frame rate consistency. The main campaign is fun, but trying to achieve gold on all tracks is challenging because the computer AI is difficult. With all flaws aside, Aqua Moto is still a decent Jet Ski game. Even though Wave Race: Blue Storm didn’t have the same memorable impact that Wave Race 64 did, it’s still a decent game. I loved the variety of tracks and playable racers Blue Storm offered. What I hated most about Blue Storm was how difficult it was. I have a few Blue Storm rage quit memories. Certain tracks felt almost impossible to place 1st in. I started to not care for the single player championship mode, lol. Maybe I am just bad at this game? The announcer and music weren’t nearly as good as Wave Race 64 either. Like Wave Race 64, Blue Storm was most fun when played with 2 players. If you own a Gamecube Blue Storm is worth checking out especially if you want a challenge, however, I don’t think it has aged well. 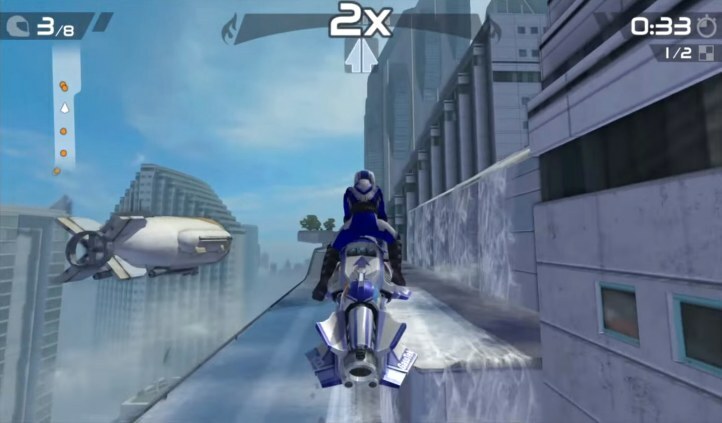 Because Riptide GP2 was first released on Mobile platforms, you might not take it seriously as a good console game. Playing on PS4 I could tell it’s a mobile port, but the graphics and controls are still decent enough. 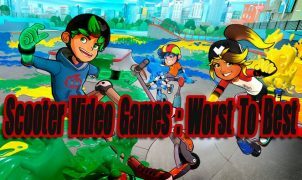 Riptide GP2 is a low budget cheap priced game, but it still has a lot to offer when it comes to fast and fun racing gameplay. Riptide GP2 offers 12 tracks to race through and a lot of air tricks to perform for an extra boost. The tracks are varied nicely, but I wish there were crazier tracks that offered bigger jumps and higher drop-offs. The playable riders are plain and lack personality, but at least there are attribute upgrades for your jet ski’s. The annoying techno music and lack of announcer are what I dislike most about Riptide GP2. Overall Riptide GP2 is a decent racing game, with a nice balance of solid tracks, smooth gameplay, and neat tricks. Wave Race 64 was the first Jet Ski racing game I played and was addicted to. Nintendo took a big risk when creating Wave Race 64. Back in 1996 creating a 3D racing game with realistic water graphics and physics was challenging to pull off. Nintendo did a fantastic job in all challenging development areas of Wave Race 64. 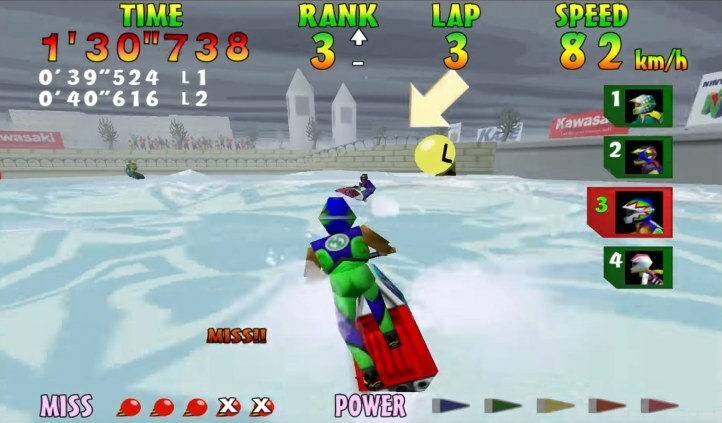 Wave Race 64’s graphics, gameplay, music, atmosphere, track design, announcer, and the challenging trick system was impressive and is memorable. I will never forget training at Dolphin Park and the announcer telling me to follow the dolphin :D. The 2 player split screen gameplay is what I loved most about Wave Race 64, but the single player championship tracks were fun also. Overall Wave Race 64 was a great memorable game. However, I don’t think it has aged too well. I recently played it on Wii via the Virtual Console and had fun, but it’s not nearly as exciting as it once was. Riptide GP: Renegade is better than Riptide GP2 in every way, but it’s still not perfect. What I like most about Riptide Renegade are the track designs and crazy tricks. There are much more air tricks in Riptide Renegade compared to any other game in the series. Riptide Renegade even includes grind tricks performed on paved rails, which are fun to pull off for some extra boost. The track designs are future themed this time around, packed with huge jumps, drop-offs, and a lot of personalities. I had a lot of fun racing on the varied tracks and upgrading my jet ski’s. What I don’t like about Riptide Renegade is the music, lack of announcer, and non-existent character personalities. Hopefully for the next Riptide game Vector Unit can include some better music, an exciting announcer, and actual playable characters. I think more of a Hydro Thunder inspiration would do well for the Riptide series. Overall Riptide GP: Renegade is the best current generation Jet Ski game available so far. Splashdown: Rides Gone Wild features over the top characters and the most memorable themed tracks in any jet ski game. 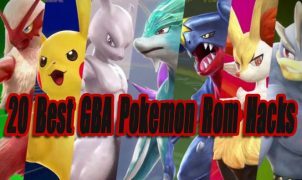 The characters are all weird and crazy, with fun personality’s, and each has unique skill attributes. Splashdown: Rides Gone Wild offers a lot of different modes and tracks to race on. 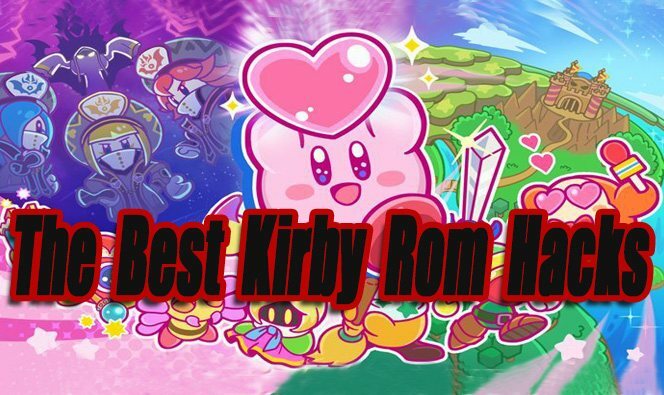 My personal favorite mode is the World Races mode, which showcases bizarre themed tracks like a flooded city, Bermuda Triangle, haunted house, or dinosaurs. 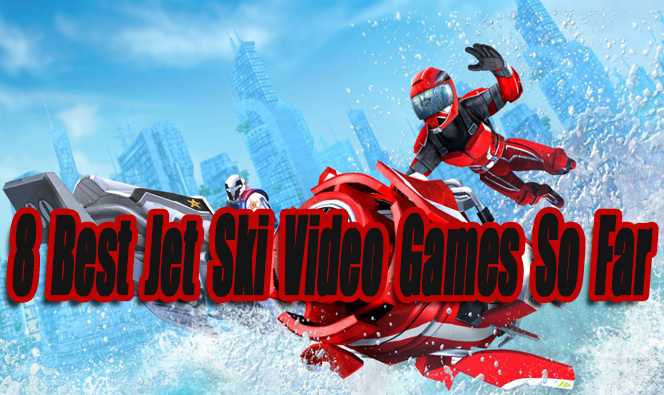 The themed tracks are extremely entertaining, compared to other Jet Ski games. The other modes offered in Rides Gone wild is a stunt mode and a time trial mode, these modes are also fun. Performing tricks off of ramps is important if you want to earn boost power. Boost power is definitely helpful when trying to win races. Rides Gone Wild also has a solid soundtrack of known and unknown rock music bands. 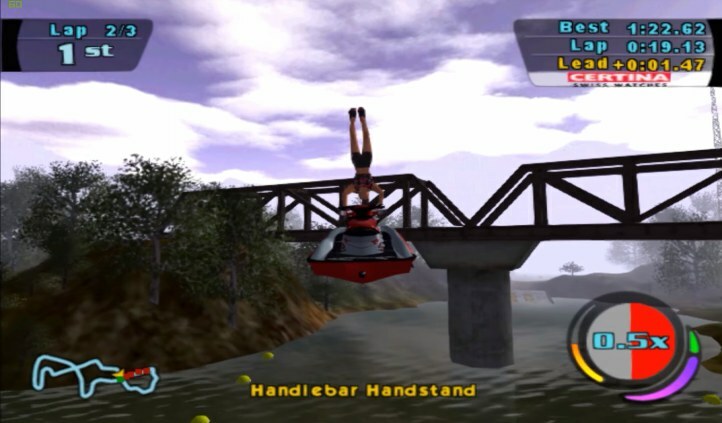 As a jet ski racer, Splashdown: Rides Gone Wild is one of the best and probably one of the more unknown games. Me, my brother and a few friends used to have a blast playing Splashdown back in my high school days (around 2003). Splashdown is still amazing and fun to play today. Splashdown was originally released on the PS2 first, but a year later it was released on the original Xbox. Both versions of Splashdown are great, but from what I remember the Xbox version had better graphics and better frame rate. Splashdown is the most well-rounded Jet Ski game to this day. Everything about Splashdown is great. The graphics, licensed fitting rock music, controls, track design, characters, and tricks were done exceptionally well. The tracks and tricks are not over the top or exaggerated in Splashdown, but they are all entertaining and designed well. I really hope HD remasters of Splashdown & Splashdown: Rides Gone Wild is eventually released for current generation consoles. If not remastered games, how about the Xbox version of Splashdown backward compatible on Xbox One X with enhanced resolution, textures, and performance would be nice :D.
The following Games either barely missed our top list or are loosely related to jet ski video games. 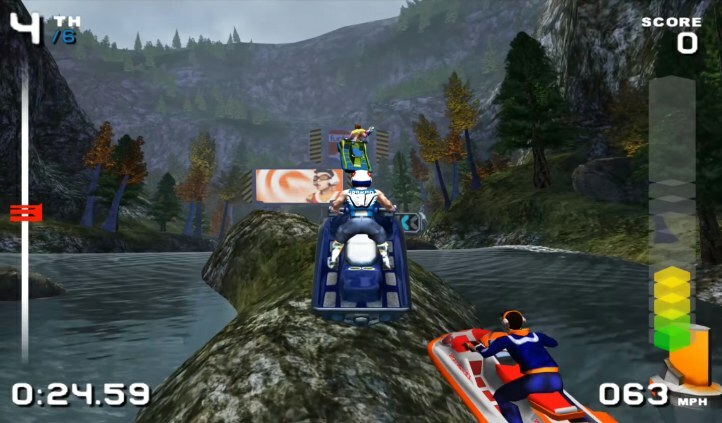 Wave Rally (PS2) – A solid Jet Ski racer that might be worth checking out if you own a PS2. 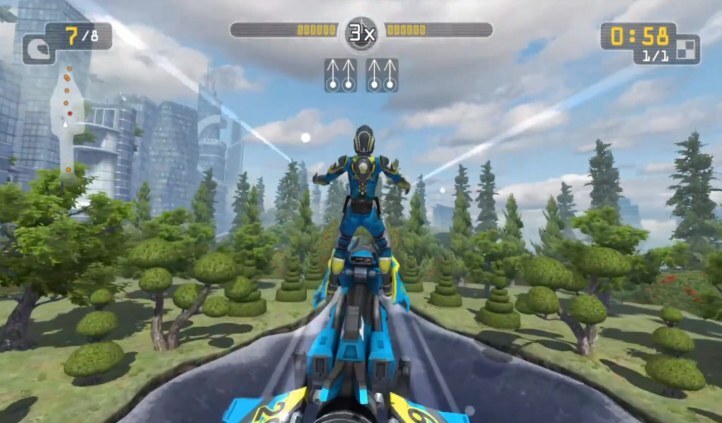 Riptide GP (Android, IOS) – The first game in the Riptide series. It’s still fun, but not nearly as good as GP2 or GP Renegade. Sega Waverunner (Arcade) – I remember playing this at the arcades when I was a kid. I doubt arcades still have this game up and running. Emulation might be an option though! Aqua Jet (Arcade) – This was made by Konami and was the arcade rival to Sega Waverunner. I have never played it, but it looks fun. Jet Moto 1, 2, 3 (PS1) – This was a really fun flying moto racing game series on the original PlayStation. Some of the tracks featured hover racing over water. These are not exactly Jet Ski games, but the similarities are there.